It's the first time snagging a treasury in Treasury West.. I was there just in time.. The title of my Treasury is VESPA. Basically a collection & selection of vespa / scooters in different medium on Etsy. Here's what the whole treasury looks like. I love vespas and I think they have this vintage feel and are very cute.. and looks easy to ride. (although I have not rode on one before). In the collection showcase on my Treasury. The following 3 items are my favorites and caught my eye. 1) Vespa Card by AJKArtistry - The Vespa on this card looks so real and has a 3-D effect which makes it so cool and cute! The photo taken was also very clear as you can see the details on the Vespa. 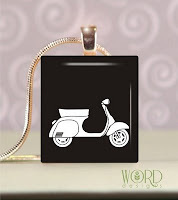 2) Vespa Scrabble Tile pendant by WordDesigns40 - I love the black & white look of the pendant and really makes the vespa pop from the jet black background. 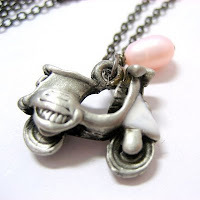 3) Sweet Vespa Necklace by ME - I love this Vespa charm as it is a solid one with details all round (front & back). By matching it with a dainty pink freshwater pearl, it brings out the femininity of the masculine vehicle. haha, I love your 'bradybunch' type photos! That's so cool! I'll have to show that to my boyfriend...he loves vespas! Really cool treasury!! love the pendant. SleightGirl - That's cool! 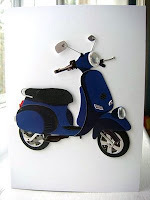 I am sure your bf would have fun browsing through..
Vespa scooters are so cute, great treasury! Katie - Yes, the pillow is really nice too..
Little Pink Plum - Thanks! I am glad you like it. you should check out the mods in my new post. they had great scooters!